Nå foreligger første låt fra det kommende albumet, pluss dato for Oslokonsert. Vulkan Arena 25. november er greie detaljer å få med seg, billettene kjøper du HER . Bandet fyrer av skive i august, titulert 'Malina'. 25. august nærmere bestemt, og dette er et album jeg vet mange gleder seg til. Nå er ikke nyheten fersk, dette ble lansert for litt under en uke siden, men med bøtter av mailer fra selskaper som vil informere er det jammen ikke lett. Men, Leprous er prioritert, norsk og fett, hva mer kan man ønske seg? Turne er plottet, ingen norske datoer så langt, men det kommer vel. Her er en saksing fra presseskrivet, på engelsk, for lønn for å oversette har jeg ikke ennå :). Following a hugely successful EU tour as support to label-mates Devin Townsend Project, the band started the recording of the follow-up to 2015's The Congregation. Frontfigur Einar: "This album is the perfect example of how you can start with a vision and end up with a result that has nothing to do with the original idea. The writing of the album started out with the idea to perfect the sound and working method we began with on The Congregation. While the writing process was actually pretty similar (30 sketches, elimination process etc etc) we gradually started noticing stuff with the sound and the songwriting on the previous album that we wanted to sound different. Gradually we realized what needed to be done. This album needs to sound more alive, more organic and more dynamic." 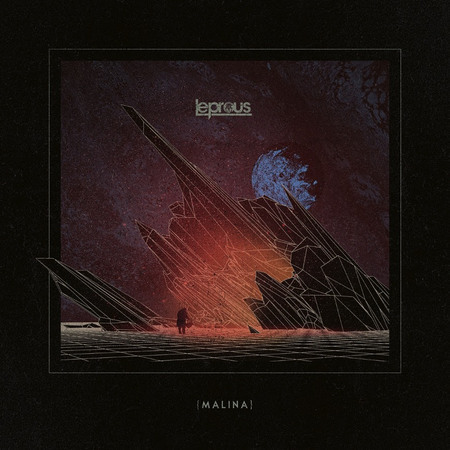 With Malina, Leprous have made every effort to try new ways of working, and push the boundaries of their sound in ways they had not originally set out to do. Einar: "We feel with Malina that we've managed to achieve a natural sounding organic album with great songs that still sounds modern. Organic doesn't necessarily equal ‘retro’. While we still very much sound like Leprous, I believe that with this album we more accurately define as a rock band than a metal band. We're insanely proud of this album, and can't wait to share it with you all." Einar om coveret: "We wanted to try something new this time, and work with a new artist. Some good musician friends of ours recommended Corey Meyers. I checked him out, and damn he's good. This is the first time we've ever received the perfect cover on the first attempt. It represents the album perfectly and looks pretty amazing!"